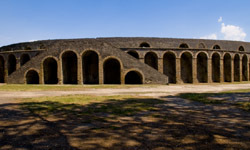 The Amphitheatre of Pompeii is the oldest surviving Roman amphitheatre. It is located in the ancient Roman city of Pompeii, and was buried by the eruption of Vesuvius in 79 CE, that also buried Pompeii itself, and neighbouring Herculaneum. Built around 70 BCE, the current amphitheatre was the first Roman amphitheatre to be built out of stone, previously, they had been built out of wood. The next Roman amphitheatre to be built from stone would be the Colosseum in Rome, which postdates it by over a century. It was called a spectacula and not an amphitheatrum, since the latter term was not yet in use. It was built with the private funds of Quinctius Valgus and Marcius Porcius. Around AD 59 CE, a deadly brawl occurred between Pompeians and Nuceria residents in the amphitheatre during games, which resulted in banning the events for 10 years. Amongst other events, it hosted gladiatorial games, which owing to the preservation of Pompeii has given insights into the gladiator culture of Rome. The amphitheatre's design is seen by some modern crowd control specialists as near optimal. Its washroom, located in the neighbouring palaestra has also been cited as an inspiration for better bathroom design in modern stadiums.